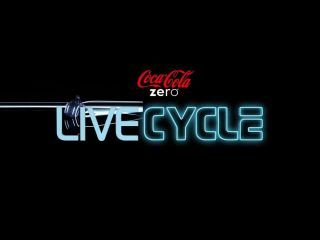 Coke is teaming up with Disney to help you 'become' a TRON LightCycle via the power of your mobile phone. The fizzy vegetable-based pop provider's new app, LiveCycle, tracks you by GPS and creates a light trail on a virtual TRON map based on where you move. The idea is to 'trap' other people and force them to crash into your wall, garnering points as you go. It has a speed limit involved, where the light cycle on your phone will 'discharge' if you're going to fast, meaning you can't eat up acres of game space by jumping in a car or using an actual motorcycle. We're not sure on the exact abilities of the game, seeing as you could theoretically stop to avoid a crash if you're just walking around - something that would probably ruin the light cycle scene in TRON. You'll also automatically create a virtual light path if you shut down the application and then open it up again in a new location linked between the two places, which could also mean you crash as well. It sounds like it could be a little confusing. You can check it out now on the iPhone, and an Android version is coming soon too, with Coke promising to "continue to push out new versions of the game both before and after the release of Disney's TRON: Legacy", which will include new single player and multi-player modes. Check out a video of the game in action... but we're not playing unless someone gives us genuine TRON suits to run around London in.